I’m a firm believer in acts of random kindness. It can make such a a big difference in the day, whether you’re the giver or the receiver. I’d explained my thoughts on this topic in an earlier post. Today I found this website – HelpOthers.org – that encourages readers to write in the kindnesses they’ve given to others. It’s not heavily trafficked, which is too bad as the stories are good. Marc and Angel Hack Life have a sister website, Makes Me Think, which also has many acts of random kindness on it. This week, I served on jury duty. One of my fellow jurors left her cell phone in her car as instructed, forgetting to bring a paperback book to read as we waited. I had two in my book bag, so I pulled them out and let her pick one. She was so thankful and later in the day, offered to return it. I told her to keep it, that I could afford to replace it. I didn’t bother telling her to pay it forward – she did that already during our lunch. For some reason the cafeteria was closed and at 1:30 pm, the judge gave us 40 minutes to leave the building and get lunch. One of our fellow jurors had no car, and the gal that I’d given the book to volunteered to take her. You know, I hate jury duty and the responsibilities it involves. But the deputy sheriff’s who moved us around were great guys and went out of their way to take good care of us. My fellow jurors worked together in a postive manner. We had a good debate, but it was polite and respectful. With minimal disagreement, we agreed on our course of action and the reasons were sound. There were acts of kindness that made the day a good one even if I didn’t want to be there. So hail to acts of random kindness, to the salve it brings to our souls, and the smile to our face. As the holiday season continues to build, remember to take time to be kind to those around you. You may very well be their angel in disguise. 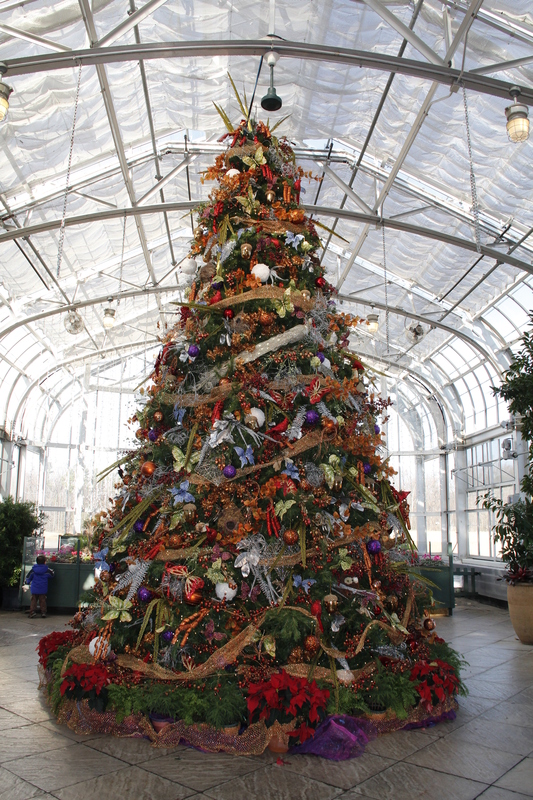 I also believe in acts of random beauty, such as this beautiful Christmas tree at the botanical gardens. Word for tomorrow – CLEAR. If you prefer to work ahead, see the list for the week under “A Word A Day”. That is a lovely tree. We were out and about for a short while today, to the garden center to look around. We needed to replace the lights for our 4 ft. tree, so now the decorating can commence. I am also a big believer in random acts of kindness. It is nice to see this come out at this time of the year. Would be great if everyone kept that spirit all year round. (some do of course). The tree is lovely! I do acts of random kindness all year, but I think this time of the year it’s particularly needed between the stresses at work plus the holidays. I loved that tree – big wow factor. That tree is gorgeous. Glad you enjoyed it. It’s also nice that you found something positive in your jury duty. As much as I dislike jury duty, it went very well. And that was a big something to be thankful for.